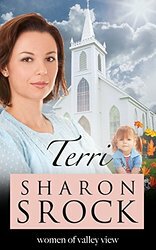 Terri is book two in the Women of Valley View Series by Sharon Srock and it is just as great as Callie and Pam (also in the series). I love the characters in these books and although the books can be read as stand alones, they are a wonderful series when combined. The stories pull you in as a reader and you find yourself befriending the characters. Terri is a great contemporary fiction book and a must read! Terri is a single woman who is feeling her biological clock ticking away. She’s not married and not dating and she longs to be a mother. After a television show awakens her to the need for foster care providers, Terri signs up to be a foster mother. She’s got everything she needs and checks off her list. As a daycare owner/provider, Terri is great with kids and already has the training there that she needs. Now it all comes down to which child needs her. But life isn’t a check list and Terri soon finds out that even the best preparation doesn’t allow for the craziness that can happen when you’re doing life. Terri has to balance everyday life, work, motherhood and romance and it’s catching her off balance. Ella and Sean had a rough start with an unplanned pregnancy at a young age but they’ve managed to make it on their own quite well, until things start coming apart. Sean’s in need of a decent job and Ella allows worry to consume her. Along the way, their daughter, Kelsey, is caught in the middle of the storm. When a fight gets out of control, Kelsey is taken from Ella and Sean. Ella is heartbroken but understands she needs to get it together. Sean is consumed with anger and doesn’t believe he needs the “system” to help him. Terri is a great story about how life happens to people. It demonstrates that there’s no way to plan for everything so it becomes essential to rely on God to strengthen and lead the way. It is the kind of book that feels like a warm hug. It is a fabulous addition to the Women of Valley View Series!